Please indulge me as I take a quick break from Star Trek to spotlight a very special little girl and her amazing parents… and an inspirational song and music video for anyone facing illness, adversity, or just being dealt a bad hand in life. I first met ELYSA SHAPIRO a little over a year ago at the beginning of first grade for my son, Jayden. His school admits a wide diversity of students, and Elysa was no exception. She had leukemia. She’d been diagnosed a year earlier, and her treatment and hospitalization had resulted in her missing her entire kindergarten year. Faced with the choice between of holding Elysa back or letting her start school as a first grader with children her own age, Elysa’s parents, HOWARD and NANCY, decided on the latter. It wasn’t an easy decision. 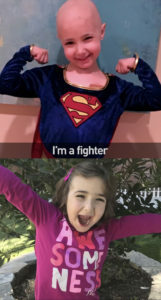 While the other kids in her new first grade class had all shared the lessons and social development of kindergarten together, Elysa had spent the prior year in and out of hospitals, wearing a mask to filter out any germs that could overwhelm her immune system, and undergoing chemotherapy and other agonizing and exhausting cancer treatments at Cedar Sinai Medical Center in Los Angeles. As welcoming as Jayden’s school is to new children and those with unique challenges, it was still a sometimes-traumatic experience for Elysa. Although most days, Elysa was just fine, with a smile and laugh and courteous demeanor that melted my heart, other days I would see her struggling, sobbing, crying to her mother not to leave her. During those first few months of first grade, while the other kids would be picked up at the back gate in the afternoon, Elysa often wouldn’t even make it through a full day and had to be taken home early. Her treatments were still going on, and Elysa’s mom and I would occasionally chat about how things were progressing for Elysa. It broke my heart to hear what this sweet little girl had to go through.